Carrying capacity assessment estimates the maximum number of people that an area of land can support. A satisfactory carrying capacity model would thus need to encapsulate sufficient aspects of land-usage that impinge on population maximums. This section looks at various carrying capacity assessment models and considers their scale of analysis as well as the insights that they have provided. Within carrying capacity literature, minor variations exist in the manner to best arrange the physical and sociological components of a carrying capacity model, but generally, they encapsulate similar fundamentals. For example, Fearnside cites population, a particular area, environmental degradation plus a combination of technology and consumptive habits; House and Williams propose resource production, environmental assimilation, infrastructure delivery and quality of life concerns; Thurow profers production, consumption, egalitarianism and social discipline; while Hardin reduces resources and lifestyle to a concept of cultural carrying capacity. Despite these differences, most authors define the limits to population by either their required inputs or subsequent outputs. 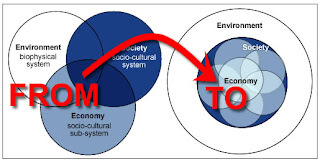 Whether these inputs and outputs are culturally, technologically, economically or physically determined, they still form the basic determinants of carrying capacity. So, in essence, resources form the limiting factor on the input or supply side of the equation while environmental impacts form the opposing carrying capacity barrier on the output side. The population is wedged between these barriers but can alter the demands of each by collectively altering its behaviour. An assessment of current carrying capacity literature suggests that methodologies can be categorised into approaches that focus more or less on the various components of a basic carrying capacity model (Figure 11). These elements include global boundaries, local boundaries, resources, population and impacts. Ultimately global limits form the outermost boundary for humanity’s carrying capacity. However, this level of analysis may not be the most appropriate scale for measuring population carrying capacity. Many authors subscribe to more localised boundary delineation within which to define smaller populations. I recently received a query from one of my architecture students who intended integrating vertical farming into their design proposition. He says: I've been looking at vertical farming and have been basing my calculations on this document (http://breannacarlson.com/Vertical-Farm-Park) which says that 930 square metres (10,000 square feet) will provide a 2000 calorie diet for 330 people. Does this seem realistic? There is certainly a big discrepancy between what this American author is saying and the calculations for Australia based on my Carrying Capacity Dashboard. 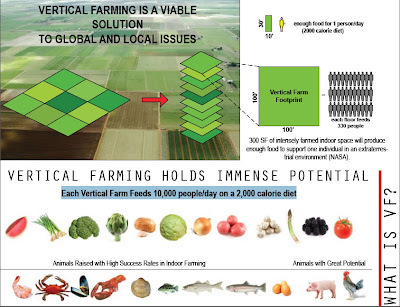 They state that it is possible to feed a population 2000 kilojoules a day on what amounts to 28m2 (300 square feet) of hydroponic production while at the moment, in Southeast Queensland, according to the Dashboard modelling, it takes roughly about 1.1 hectares per person (with 100% irrigation) for 1746 kilojoules. That’s 28m2 versus 11,000m2: about a 40,000% difference! 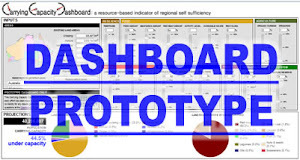 Modelling for the Carrying Capacity Dashboard is offered at three different geographic scales within the Australian context – national, state and regional. However, it is also possible to use this modelling to make estimates for even smaller areas. It is important to note, however, that if using the following procedures to model local area carrying capacities, the agricultural yield data will be reflective of the larger region rather than of the local area. In some cases local conditions may be very similar to the regional context, but this might not always be so. The following instructions apply to two potential approaches: firstly for those who have an area of land in mind and wish to know how many people it can support and secondly, for those wondering how much land would be required to support a certain number of people. Scenario 1: How many people can my local area support? 1. 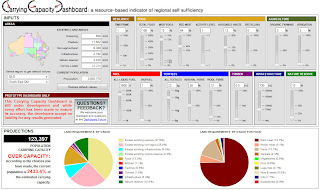 Open the Dashboard (http://dashboard.carryingcapacity.com.au/) and choose the region in which your local area falls (ie. choose the state, then the region). For example, if you wished to test the carrying capacity of say, the Noosa Biosphere, then choose the South East Qld region. 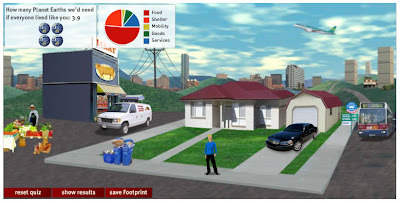 Global Footprint Network’s online Footprint Calculator. The user takes on an avatar who inhabits a suburban scene which is progressively illustrated while lifestyle choices are made. Then, at the end of the process, the user is informed of their global footprint and the proportion of land-uses required such as land for food, shelter, mobility, goods and services. The application of mathematics to the prediction of population dynamics has challenged demographers for at least two hundred years. Various proponents have developed formulae for both the calculation of population growth as well as the potential limits to such growth. While these formulae on their own have not always been able to accurately predict human carrying capacity limits, in many cases they have contributed to the development of more complex carrying capacity models. [i] As such, they have often been theoretic in nature, rather than having direct applicability to a particular landscape. where P(t) is the population at a point in time, Po is the initial population, e is the base of natural logarithms (2.718...), r is the growth rate and t is time. This formula generates a j-shaped curve with population reaching to infinity (figure 1a). However, according to Malthus, this infinite growth is inevitably halted by the inability of food production to keep up with the population’s exponential expansion (figure 1b). Figure 1a. (left): Malthusian exponential growth curve showing how the population increases infinitely. Figure 1b. (right): Malthus’ exponential population growth curve limited by the linearly increasing food supply. The assumed carrying capacity is the point at which the population projection intersects with the food supply projection. The carrying capacity is assumed in this instance because Malthus did not refer to it as carrying capacity. 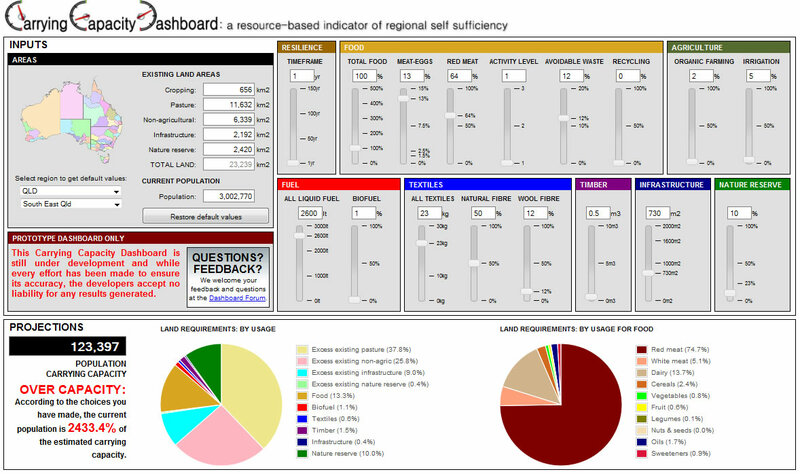 In its broadest sense, research around the Carrying Capacity Dashboard aims to highlight how society’s understanding of constraints to the productive capacity of its resource base is vital to its long-term survival. A growing mainstream awareness in the importance of linking a population to the carrying capacity of its landscape has to date, largely been rhetorically rather than empirically tackled. 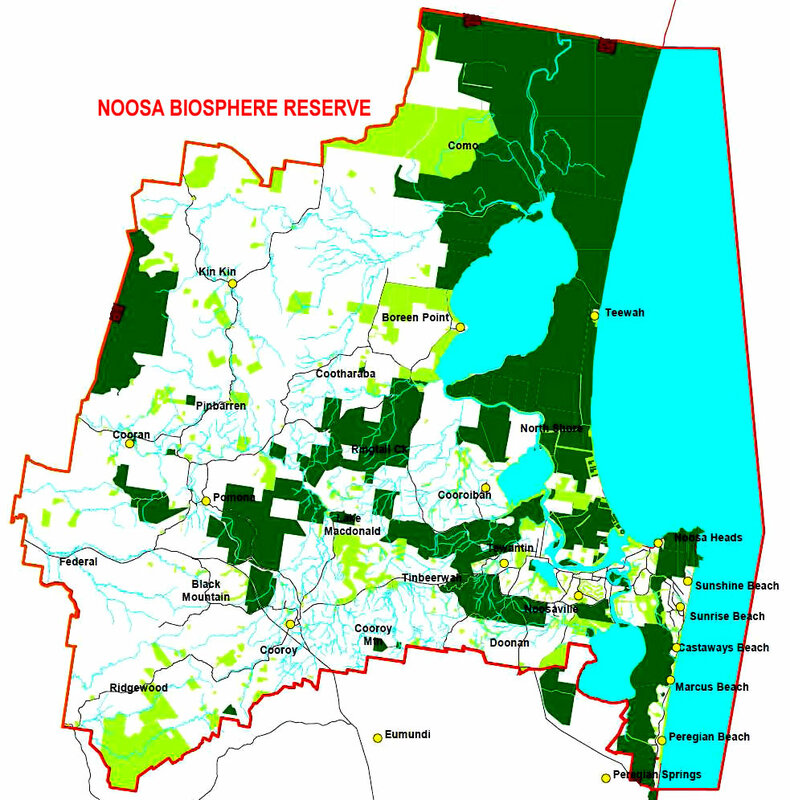 For instance, while both the Redlands City[i] and Sunshine Coast Regional Councils[ii] have publicly committed to living within their carrying capacities, they don’t currently have the tools to determine the actual extent of these limits. This research aims to identify, examine and compare existing approaches to carrying capacity assessment and consider their relevance to future spatial and infrastructure planning. It raises the following questions: Which carrying capacity assessment models are best suited for determining future sustainable land-use and community infrastructure? What gaps in existing research need to be addressed? Is it possible to achieve a practical model for assessing regional human carrying capacity? This research aims to add practical application to what are currently well-intentioned but untested emerging societal aspirations concerning carrying capacity assessment. Basic questions such as, “How much land does a population require for its minimum resource requirements?” are currently not easily measurable. It is anticipated that the carrying capacity model developed through this research, can more accurately define the variables inherent in this question, and more clearly articulate possible outcomes. For example, the model might suggest that a certain region’s population may currently be within the carrying capacity of its landscape for one year of average production given existing consumption patterns, but perhaps it may be over-capacity if longer timeframes or different consumption patterns are applied. Carrying capacity assessment thus offers a dynamic tool for ascertaining population thresholds and potential future population distributions, as well as providing important guidelines for living within these physical limits. As such, it has the potential to influence urban and rural planning policy at all levels of government. It can also be useful for researchers and educators in highlighting system boundaries and physical limits to design proposals. Perhaps above all else, it can help individuals and local communities to more clearly define lifestyle changes necessary to ensure more resilient and sustainable societies in the future. There is evidence to suggest that the struggle to subsist at or below the earth’s biophysical carrying capacity has dictated the behaviour and size of the global population since our very earliest beginnings. In fact, carrying capacity constraints are most likely the leading driver of societal systemic change from hunter-gathering to swidden agriculture; and from cultivation and pastoralism to modern industrialised agriculture. As each phase of human development reached its natural productive limits, pressure to ever-increase the local and global population has led to successive cultural and technological revolutions. Despite a consistent expansion of human population, there have been periods of relative stability in which societies have managed to both assess the carrying capacity of their local environs, and also consciously maintain a population below its ecological limits. For example, the Australian aboriginal population of hunters and gatherers maintained a relatively stable population across the entire continent for millennia. [i] In a swidden agricultural system, the Maring people of Papua New Guinea developed an elegant and well documented[ii] system of carrying capacity assessment; and the agriculturally-orientated society of Tokugawan Japan[iii] also managed to maintain a reasonably stable population based on the carrying capacity of local regions. There are presumably many other historic precedents of populations intentionally living within carrying capacity-imposed limits but documented examples are few; and since global industrialisation has significantly expanded the resource-base, examples of self-sufficient societies living within their regional long term ecological capacity are arguably non-existent. The growth paradigm of the modern industrial era has meant that population expansion, along with its concomitant schema, economic expansion, has largely been viewed favourably, if not embraced wholeheartedly. There are clear signs that society is threatening the biophysical limits of our shared environment and that the size, distribution and behaviour of the population is to blame. The seven billion-strong global human throng is exerting such pressure on our existing societal and environmental systems as to suggest a re-evaluation of existing approaches to the way in which land and resources are managed and to the very structures that allow these problems to escalate. We need to fundamentally reshape our land-use planning practices to align with the biophysical constraints of the landscape. To this end, we need the tools to quantify these constraints, analyse them collectively, and then make predictions about their behaviour to inform planning decisions. This practice defines the process of carrying capacity assessment. The question of global overpopulation has challenged the world’s sociologists since Thomas Malthus raised the prospect over 200 years ago. Malthus [i] argued that while human population potentially grows exponentially, the resources required for human survival remain relatively finite. To date, society has largely managed to produce the resources necessary to feed, house and clothe the majority of the earth’s inhabitants, though in vastly differing degrees of comfort, and Malthusian sceptics[ii] argue that his predictions of over-population have not eventuated because advanced technology and the use of high-energy fossil fuels have allowed for a significantly expanded resource-base. However, this mode of industrialised production and consumption has proven costly, with world-wide environmental degradation, resource depletion and social inequities escalating, and an ever-increasing global population serving to magnify the problem.